Classic national dish of Cuba. Slow Cooker Meal - Ropa Vieja is the slow-braised, tomato-rich, beefy national dish of Cuba... and you can make it at home! Everything is included, and your slow cooker will create the complex flavors for you with no prep, no work & no worries. Even if they haven't had this one before, they'll definitely be asking for it again. 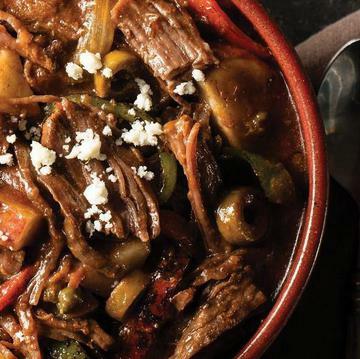 Slow Cooker Meal Meal Ropa Vieja is made with rich, beefy skirt steak that braises for hours until it's fork-tender in a rich red tomato sauce made with red peppers and garlic, tossed with capers, green olives, fire-roasted onions, red and green peppers, and skin-on red potatoes. Right before it's done, steam the included rice in minutes and serve! Each package feeds a family of four or eight. FOR FOOD SAFETY AND QUALITY, FOLLOW THESE COOKING INSTRUCTIONS. FOOD MUST BE COOKED TO AN INTERNAL TEMPERATURE OF 165°F AS INDICATED BY A FOOD THERMOMETER. READ INSTRUCTIONS THOROUGHLY. Do not thaw. Keep frozen until ready to cook. Appliances vary; adjust cook time accordingly. Remove bag and 2 packages of beef from box. Carefully open bag and remove the black beans & rice pouch and 2 sauce pouches. Return beans & rice and bag containing vegetables to freezer. Open beef packages and place beef in bottom of slow cooker. Open sauce pouches and place sauce on top of beef. Place lid securely onto slow cooker to minimize moisture loss. Select power level and cook time (see chart). Without stirring, add frozen vegetables to slow cooker for the last hour of cook time. Replace lid and cook for 1 hour. Microwave beans & rice pouch on high for 3 minutes. Carefully open pouch. Stir contents of slow cooker and serve over black beans and rice. Ingredients: SAUCE (TOMATO SAUCE [TOMATOES, SALT, RED PEPPER, DEHYDRATED ONION, DEHYDRATED GARLIC, SPICE EXTRACTIVE, CITRIC ACID], ONIONS, WATER, FIRE ROASTED RED BELL PEPPERS, GARLIC PUREE, GREEN PEPPERS, GREEN OLIVES [OLIVES, SALT, AND LACTIC ACID], VIRGIN OLIVE OIL, CAPERS [CAPERS, WATER, VINEGAR, SALT], CORN STARCH, SPICES, SALT, PAPRIKA, GARLIC POWDER, ANNATTO), COOKED WHITE RICE AND BLACK BEANS, FIRE ROASTED RED AND GREEN PEPPERS, ROASTED RED SKIN-ON POTATOES, FIRE ROASTED ONIONS. INGREDIENTS: BEEF INSIDE SKIRT.